Two days after my Conscious Bite Out dinner, I get the opportunity to give back. A great source throws me in the mix to participate in the “Get Out of the Kitchen” launch event for the Pride Outside Campaign. 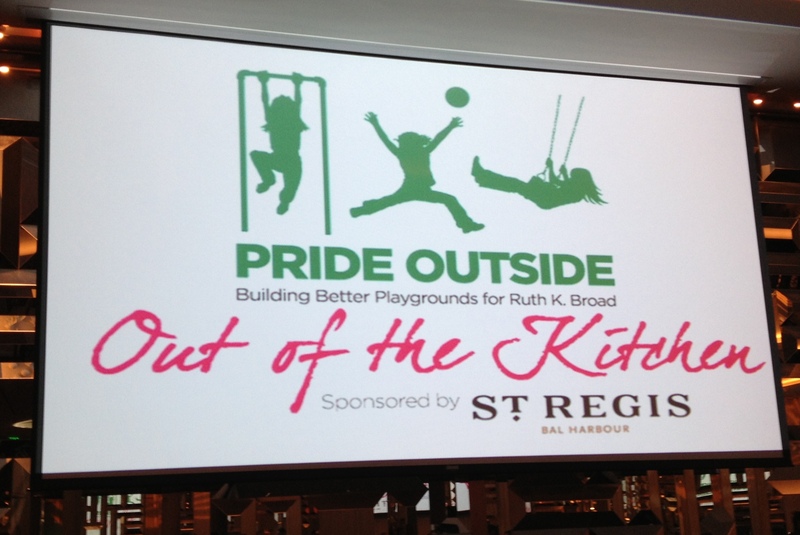 They a re set out to raise over a million dollars to build new playgrounds in Bal Harbour schools. The new St. Regis was the host of the event and I was among 16 other top chefs in Miami and Fort Lauderdale volunteering their time and food for a great cause. Jose Mendin chef of my favorite spots in Miami, the Pubbelly Group, Timon Ballo of another one of my go-to places Sugarcane, Giorgio Grapicavoli, Chopped winner and chef/owner of Eating House, Jeremy Ford from 3030 Ocean, who I know now, is practicing being self sustainable and growing his own produce in a greenhouse at his home in Fort Lauderdale, and many other local reputable top chefs dished out our best to this well dressed crowd. Each of us had our own station set in the ballroom with a table of 12 in front of us. We chose the menu and the décor for the table based on our restaurant. I obviously do not have a restaurant but Sacred Space Miami provided a beautiful set up to go along with the only plant based menu of the night. Next is another variation of my Bee Pollen Salad- swiss chard, fennel, mango champagne coulis. 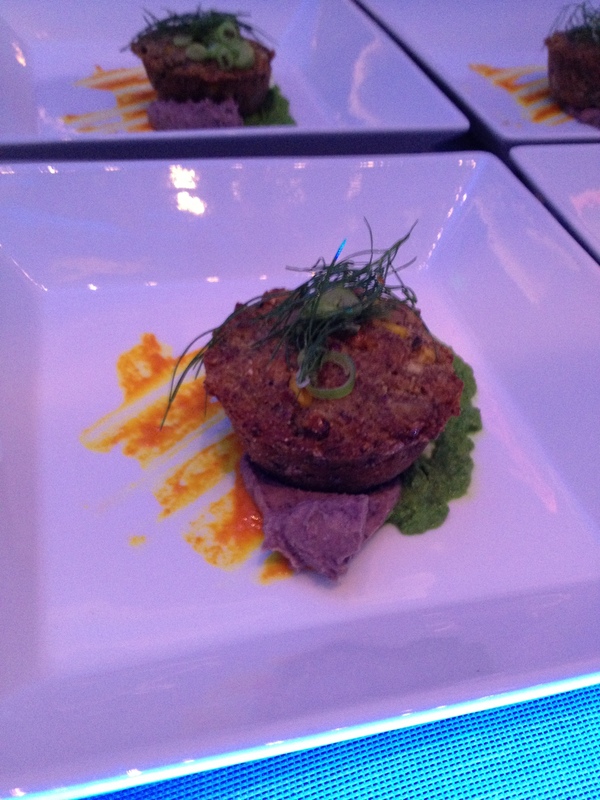 Appetizer was Coconut Corn Cake-black bean puree, scallion-jalapeno salsa and turmeric paint. Entrée was the best and here I did something a chef should never do. Rule of thumb: never do a dish for the first time when you are in front of a live audience. I tend to want to take this risk often and has yet to totally blow up in my face. Maybe a little splatter, but not totally. I do a pasta duo: Purple pappardelle with porcini cream and maitake mushrooms and a Whole Grain Risotto with Kale pesto and marinated red beets. It was the pappardelle that I had practiced just hours before and decided to put it on the menu. It paid off. 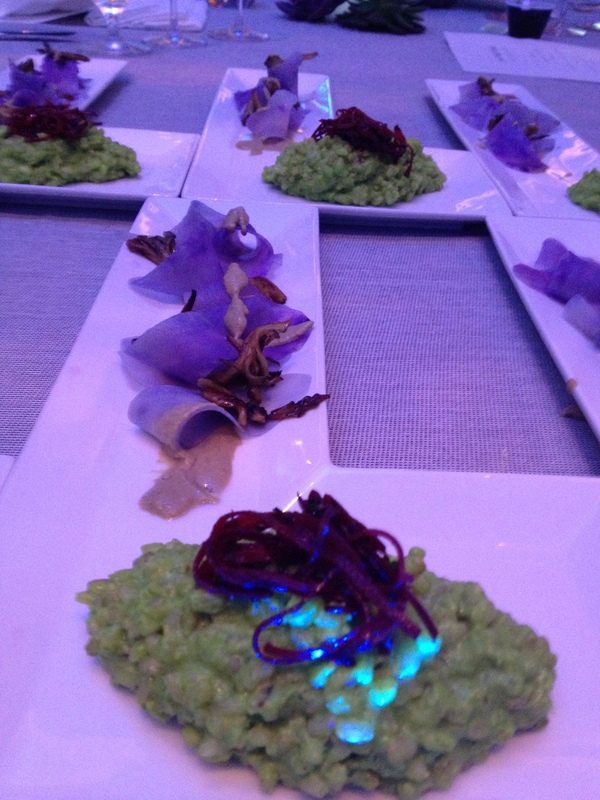 The lighting in the room illuminated a florescent purple and my guests were left asking what it could possibly be if it wasn’t pasta. I had some great help from my friend Misha, a fellow chef here in Miami and overall the night was a great success. My non-vegan guests were continually surprised at what was going on in their mouth after every bite. The questions poured in and gave me all the room to pass on the benefits of eating this way, even in such an upscale environment. Putting this plant based lifestyle at the foundation of my philosophy as a chef is a risky one and coming from my meat and potato-Bostonian heritage, it is more like frowned upon. Well, I have always been a bit of a risk taker and not afraid to stand behind something that does not get the majority rule. Sadly, in this case, it is more of a skewed perception and lack of education than a valid reason to not see the benefits of a plant based culinary foundation. In my opinion, this will be the future of all cuisine if we are to sustain this planet and increase the declining health of our population. After the event, Executive Chef of the St. Regis, Tom Parlo, put out a spread in a few of their meeting rooms and invited us chefs back for a bite and a cold one. I got to meet some great chefs; some that I knew, some that I have wanted to meet. I spoke to some of them about getting together in the future as I plan a “closed doors dinner” at my new place in Wynwood. The minute I moved into this up and coming artsy neighborhood and saw the potential of the huge space I live in, I thought underground dinner club!! Showcase a local artist, maybe a guest chef once in a while, food you cannot find anywhere else. It’s just what we need here in Wynwood. Stay tuned for more info on this small invite only dinner that I want to hold at least once a month.